Only negative cues prevailing for tommorow’s market. Inflation and Crude Oil fears to demolish traders and Investors sentiment. So what we can expect from tommorow’s market. Traders are in thought that is there any chance of sustaining the uptrend what we saw last month? Will bulls restore the place of bears despite global weakness? And what nifty charts are telling whether to short nifty or to go long at lower levels? Gap down opening may possible on tommorow( 12th May,2008 ). 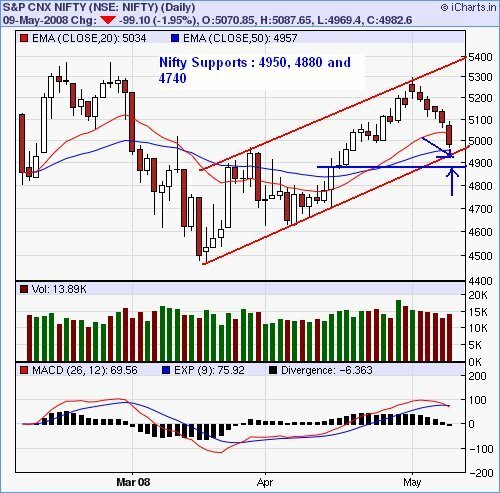 If Nifty breaks 4940-4950 band then next support at 4740. So if we want to sustain the upmove then we should hold 4950. So Nifty may try to breach 4950 and even 4880 and then a bounce back to 4950 at late trade or one can expect even above. So be carefull in selecting stop loss. Right now technical indicators show strong sell Signals and there is a chance of turn around and also have an eye on Yen currently trading at 102.85/dollar. More the yen appreciation more the FII selling pressure.Chance of Bounce back if Yen is not breaking below 102.85/Dollar.